MONTREAL (July 1, 2014) – Montreal Canadiens general manager Marc Bergevin announced today that the team has agreed to terms on a one-year contract (2014-15) with free agent forward Manny Malhotra. In 69 games with the Carolina Hurricanes in 2013-14, Malhotra recorded 13 points (7 goals, 6 assists), including one game-winning goal. He ranked second in the NHL with a 59.4% efficiency percentage winning 566 of 952 draws in the face-off circle. The 6’2’’ and 220 lbs forward directed 53 shots on the opposing net and added 82 bodychecks with 11:35 of average ice time per game. Malhotra, 34, recorded 291 points (115 goals, 176 goals) and served 439 penalty minutes in 933 regular season games since making his NHL debut with the New York Rangers back in 1998-1999. He recorded 12 goals on the powerplay, three winning goals and 25 shorthanded goals. In 32 playoff contests, Malhotra scored twice, including one powerplay goal. At the junior level, Malhotra played 123 games in three seasons with the OHL’s Guelph Storm from 1996 to 2000, registering 99 points (34 goals, 65 assists). On the international stage, Malhotra was a member of Team Canada that won the bronze medal at the 2000 World Junior Championship. A native of Mississauga, Ontario, Malhotra was selected in the first round, seventh overall by the Rangers at the 1998 NHL Entry Draft. 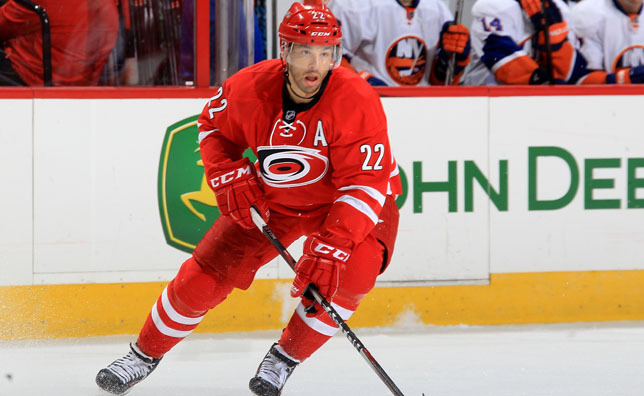 Prior to joining the Hurricanes, Malhotra suited up for the Rangers, Dallas Stars, Columbus Blue Jackets, San Jose Sharks and Vancouver Canucks.